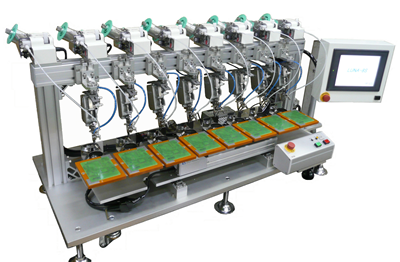 The COMET series of automated soldering robots has been developed with many configurations to meet various end-user requirements. These systems are available with a range between 2 heads and 8 heads for maximum throughput. There can be from one to six axes programmable depending upon the application requirements. The teaching position, tip temperature and soldering parameters can be entered using a large touch panel display. The programmable axes motor drivers can be either servo or stepper motors.